Currently, the bins with lids sold on the market need to be manually or footed when opening the lid. The main disadvantage of this way of opening the lid is that it is neither hygienic nor convenient for the user. After meticulous research and development, a trash bin that was opened automatically by infrared sensors was born. People don't need to touch any part of the trash to throw in trash. The product's automatic opening and closing lid control system consists of a microcomputer control chip, an infrared detection device, a mechanical transmission device and a linkage mechanism. It is a high-tech new product integrating mechanical, optical, and electrical technologies. It has reliable performance, long service life, and consumption. Low power and other advantages. Turn on the power switch at the back of the bucket. The red indicator light is on (about 3 seconds). After that, the indicator blinks every 3 seconds, indicating that the circuit system has entered the working state. When throwing garbage, just close the object or hand to a distance of 20cm above the sensing window (vertical direction). After about 0.5 seconds, the lid will open automatically and the lid will close again after 3 seconds. If the hand or object does not leave the sensing area, the lid will remain open. After the garbage in the bucket is full, the top lid can be completely removed, and the inner tank can be taken out to empty the trash. The indicator light flashes red (every 3 seconds) when it waits for a while. The indicator light is green when the cover is opened. The red light is displayed when the cover is closed. The green flashing signal is displayed after the cover is manually opened (flashes every 3 seconds). 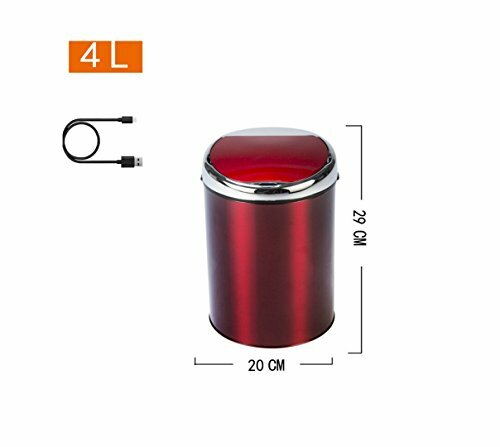 Intelligent sensor opening and closing, convenient and healthy, intelligent trash can, infrared sensor technology When the human body is close to the trash sensing area, the lid can be opened automatically. When it comes to garbage, there is no need to contact the trash can for convenience.